Road to Nowhere is the story of Teresa Chafey. She is eighteen-years-old and has run away from home. Teresa has just found out that her boyfriend, Bill, is in love with someone else and, as she climbs into her Mazda 626, the weather is as foul as her mood. Lightning lights up the sky as she drives away and she isn’t even sure where she is going, but heads north. Just as she is approaching the freeway on-ramp Teresa spots two hitch-hikers standing in the rain. They are an unusual-looking couple and although she has never before stopped to pick up hitch-hikers Teresa decides to pull over and offer them a lift. The guy tells Teresa that his name if Freedom Jack and he is a magician. His companion is called Poppy Corn. Free is quite a charismatic guy and impresses Teresa with a few card tricks as she drives. Poppy, on the other hand, is rather and sullen and it is obvious to Teresa that Free and Poppy’s relationship is strained to say the least. Free suggests that they tell stories to pass the time and he and Poppy share the story of two friends of theirs, John Gerhart and Candice Manville, but what begins as a love story quickly turns into a tale of woe. Free knew John better than Poppy did and so, in the main, it is Free who tells John’s story. Poppy, however, was closer to Candice and so she steps in to tell the story whenever she feels that Free is getting it wrong. Teresa’s story is also about young love going wrong and she doesn’t mind sharing it with her two travelling companions. Talking about it might help her to get it off her chest. The only problem is that, as she tells her story, Teresa begins to realize that there might be a lot more to it than even she realizes. At first glance Road to Nowhere appears to be quite a simple story about a journey. The journey in this case though, is far from simple and all three characters carry a lot of hidden baggage (emotional) with them and as the story progresses the reader discovers that nothing can be taken at face value. Teresa and her passengers make a few stops along the way and two of them are particularly interesting. The first one is at a castle, where Free introduces Teresa to the resident witch, who offers to tell her fortune. And the second one is at a remote church, where the priest seems to know a lot more about Teresa than he should—maybe more than she does herself. Road to Nowhere is only 175 pages long and could easily be read in just one sitting. The book also contains a teaser for Pike’s novel Sati. This adds a further 10 pages. I enjoyed the book. The characters are interesting and—I thought—rather unique. They are easy to like and there is an air of mystery to the tale that hooked me in early on and I couldn’t wait to find out what was really happening and how it would all turn out. 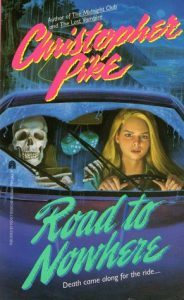 The book has its moments, but Road to Nowhere contains more in the way of surprises than shocks; so if you are looking for a story where the blood and guts fly and splatter then this one won’t be for you, but if you prefer stories with more intrigue than bleed then you might want to give it a try.